I have a confession and I hope you don’t judge me because of it…. I don’t use foundation. Ever. I wouldn’t even know where to start. I know it has something to do with matching your complexion and some other complicated stuff (mixing shades to find the perfect match) that I’m really not interested in. What can I say, I’m lazy. Like…. Saying all that just made me tired. Thankfully the skin gods did smile upon me and I do get away with minimal coverage *bows to the heavens*. Add a very specific skincare regimen to my equation and I’m good to go. For me it’s all in the moisturizer. Since I have very oily skin, I am very picky with what touches le visage. Cue oil-free tinted moisturizers with spf. Say word? Tell me more! I have tried a few and like them, but like every other Diva on a Dime, I like to stretch my dollar as thin as I can. Some bb creams are great while others are nothing to write home about. So why don’t I just try them and share my thoughts? I can’t be the only girl who doesn’t wear foundation, am I? AM I?!? I just use mineral powder once everything is done. We’ll talk about those another time, though. I like Maybelline products – usually. They’re affordable and certain products (like their mascaras and gel eyeliner) are just great. 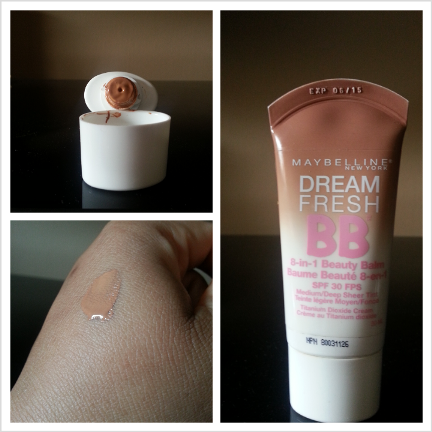 Imagine my excitement when they started making bb cream – Dream Fresh 8-in-1 Beauty Balm. When I saw them on sale at Shopper’s Drug Mart for $6.99, I thought this was my opportunity to try it out. I tried the “Medium-Deep sheer tint” on my hand in the store and it seemed to match. But from the first time I actually used it on my face, I noticed it was too light for my skin (and this is my winter complexion at that) and it gave me a chalky look. No bueno. I think if it suited my skintone it would even out the skin nicely. But there is only one shade darker than this and I somehow I don’t think someone my complexion should be using the darkest tint offered. They need to take their formula back to the lab and add a few more. I do like that it was true to their “oil-free” statement. But people with darker skin tones can not use this product. There goes a good chunk of their potential market. I’m not even interested in trying the darker tint! Have you tried this product? Leave your comments below! question to the all-knowing ladies of TNL — what does BB stand for? Oh the title totally makes sense now! 1. I was going a little crazy not knowing what the heck a “BB” was. With every commercial I would be like: “Oh great…a new BB…now what does ‘BB’ stand for?” So thank you for finally clearing up that mystery. 2. I don’t wear foundation either. 3. I too am lazy. Lol! Glad you enjoyed it Kath! And your feedback was awesome. It’s amazing how many don’t know what it stands for, then you feel like you’re being excluded from some cool club. Then you find out and it’s like “… oh okay then….”. woo! I’m not the only one in the no foundation category. I KNEW I’d find answers here. I was just about to msg you and ask what BB meant… then I was like… let me ask the leopard. The leopard knows all. I don’t use foundation either, but I love BB creams. My absolute favourite is Estee Lauder Daywear – it comes in one “colour” that looks like it won’t match your skin, but it adjusts to any skin tone. It also smells like fresh cucumbers which is kind of nice. My second favourite is Garnier Nutritioniste Skin Renew BB Cream Miracle Skin Perfector (that’s a mouthful!). It offers more coverage than the Estee Lauder Daywear, but it is still nice and light. I wasn’t blessed with flawless skin, but I don’t like the feeling of foundation so the BB creams offer just enough to make me feel polished. Thanks for the review! Thanks for your feedback, Seph! I’ve heard great things about Garnier and had planned to try it out. I’ll be sure to write about it 🙂 Now I’ll add Estee Lauder to my list! BB cream is a must for me. Always need to apply this under my foundation. It’s amazing stuff. They also have CC cream but I have yet to try this stuff. I’m hoping it comes in one of the many beauty boxes I subscribe to. I’d love to try it before I go out and buy it.